Greenfields praised by Secretary of State for Education! 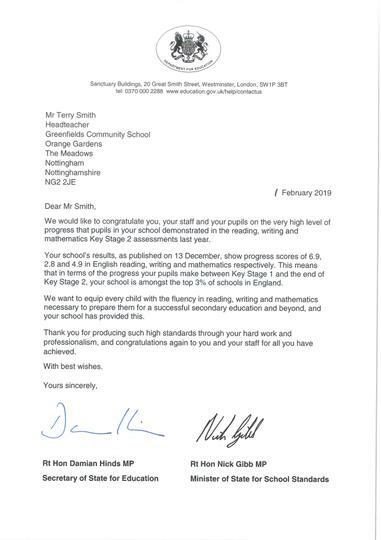 We were absolutely delighted to receive a letter this morning from the Rt Hon Damian Hinds, Secretary of State for Education, congratulating the school and the staff and children on the fantastic progress scores in last Summer's KS2 SATs tests. The progress that the children made puts Greenfields in the top 3% of all schools. 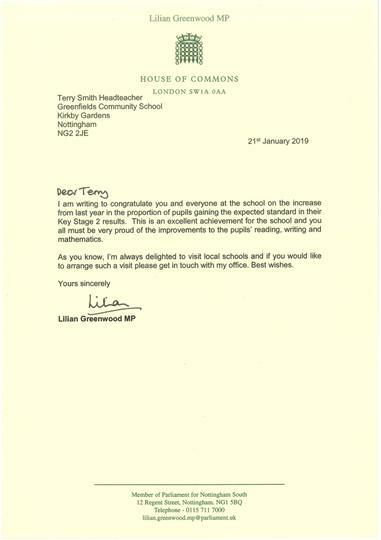 It was also great to receive a letter last week from Lilian Greenwood, MP for Nottingham South, congratulating the school on its performance in last years SATs tests. We were very proud to receive both letters.